Sweet Sentiment: A cool drink you say? A cool drink you say? House mouse and friends Monday challenge was to use one of their images with a cool drink for the hot summer.... Can do! 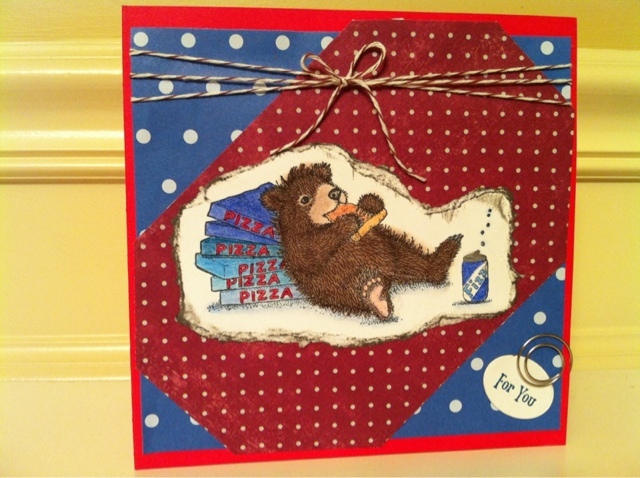 Here my favorite lil bear with his pile of pizzas and his soda pop fizzing away. I also used a red and blue color combo to satisfy the challenge over at marks finest papers/fox and friends. Happy weekend everyone!! Hi Jammie, a gorgeous card, stunning patriotic colours!! Fabulous colouring of that so adorable Gruffie!! Love this fab gruffie image..cant beat a coal to wash down pizza with..lol great clean design & colours. Thanks for sharing with us at HM & friends chall this wk. This Gruffie will surely need a drink to wash all that pizza down! This is so stinkin cute I love it! Thanks for joining us on FOSTV! Adorable! Thanks for joining us FOSTV. What a fun card - that is a lot of pizza. Reminds me of the office some Mondays when people have worked all weekend - pizza boxes stacked high! LOL! I love this! I FEEL like this!!!! What a great image for a holiday! Thanks for joining us at FOSTV this week! I had to laugh when I saw this card. Thanks for joining us this week at FOSTV. What a cute image! It's darling done up in red, white and blue! Cute, cute....I wouldn't mind joining in for some of the pizza. :-) Thanks for joining us at FOSTV this week. Oh how cute. I love the image not the pizza. LOL. Thanks for playing along with Friends of SpeedyTV. We hope to see you again next week. Be sure to check out all the other challenges on SpeedyTV for more chances to win free stamp sets from Marks Finest Papers, a Heinrich Co.